I made a bra! I had always thought this was something that was a waste of time, would be too fiddly and too difficult to fit. However recently, for some weird reason, the idea popped into my head and I just couldn’t get it out until I had given it a go for myself. To give me a fighting chance of it fitting correctly, I used one of my well fitting bras as a pattern. Using the tips from Susan’s Measure Twice/Cut Once blog I carefully unpicked half of my bra leaving the other half so I could see how it went back together again. (the bra was old and manky but still fitted well). The pieces are quite small to work with and the seam allowances are teeny tiny, mostly about 6mm, but the construction was generally quite straightforward. With the other half of the bra left intact, it was relatively easy to work out the order of construction and all up the process took about 4 hours. Not bad I thought, especially for the first one. Even better, the fit is perfect! 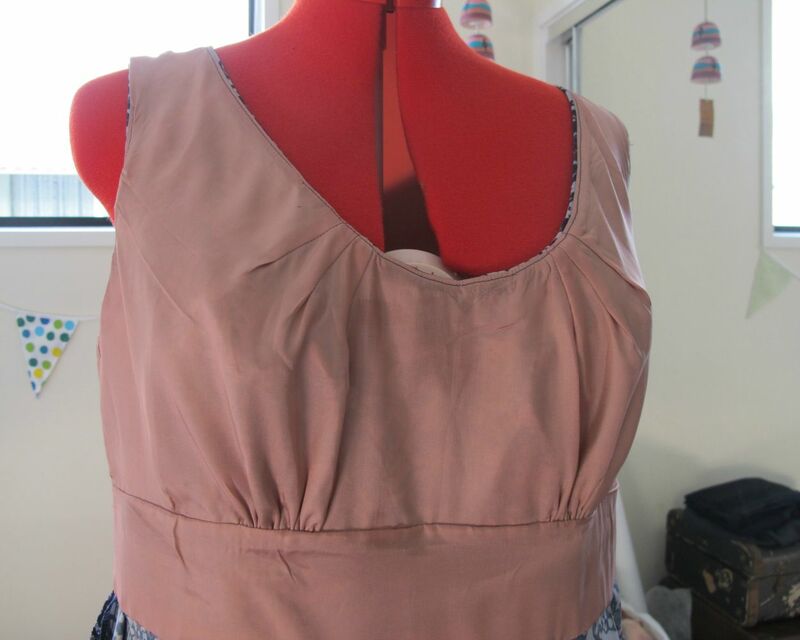 The insides of the bra are not finished but as they are all of stretch fabric there are no fraying issues. I topstitched all the seams also for a professional finish. My original bra had some kind of stabilizing tape on the seams that covered the seams, but I couldn’t find this in the store. I bought all my supplies locally at Make It Fabrics who have mostly everything I could want, although sometimes finding just the right colour is tricky which is why my elastic on the back is a slightly different colour. It was all I could find and at the time I didn’t know what I could or couldn’t change. Most of the construction was done in straight stitch, except for the elastic which was sewed in a triple zigzag stitch. ensure the bridge (middle bit) does not stretch at all, this affects whether you have cleavage or not! bras are super fun to make and rewarding, I can now use all the colours and laces!! now that I have one I will experiment with different fabrics. The cups of my original bra don’t stretch much so is there any reason I can’t use cotton? apparently I have no shame, putting my underwears on the internet for all to see!! Generally I find bra shopping to be really difficult in “normal” stores at least. 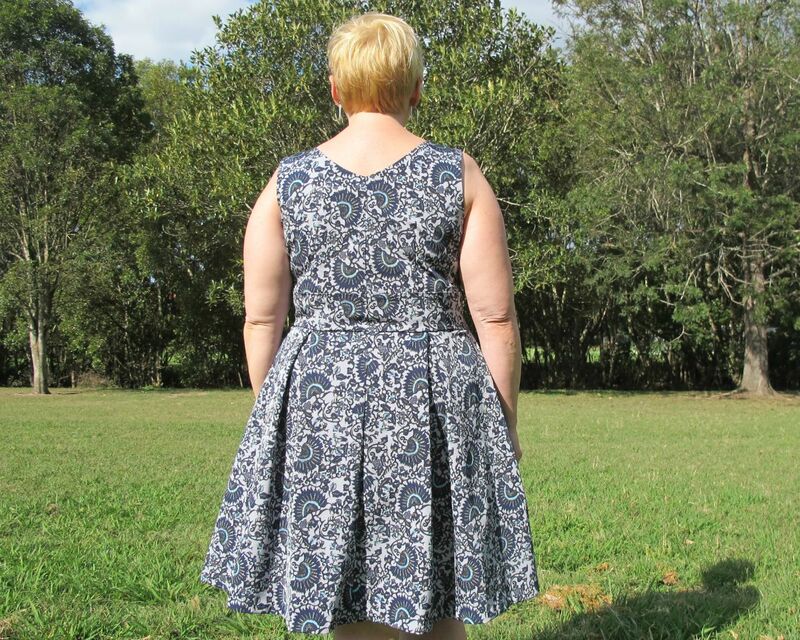 My cup size is too big for the straight sizing range, but my back and shoulders are too narrow for the plus sized ranges. I will definitely be making more, in fact I have already cut out my next one! Not only are they fun to make, the price savings alone make it worthwhile. For something different I am writing this from the train travelling from Graz to Vienna! I have been in Graz for the past few days judging a competition of some of the best skaters in the world. What an amazing opportunity that I am proud to be a part of. This is Vogue 8998, a princess seamed bodice with waistband and two skirt options. Although I didn’t take either skirt option, I switched in my new favourite skirt from V8555 with the box pleats and side seam pockets. 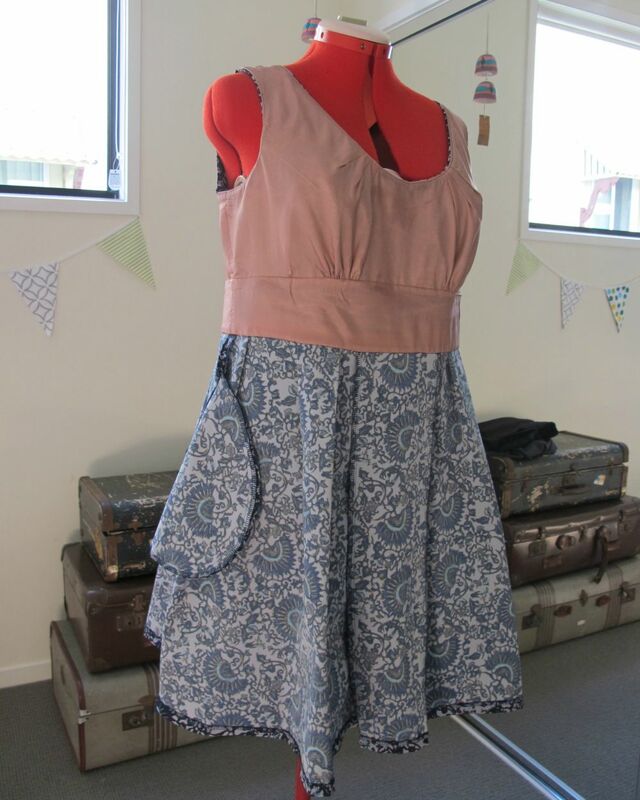 I also omitted the side pleats because (a) I didn’t have enough fabric and (b) I didn’t want the skirt quite that full. The pattern has cup size options, of course I went with the D cup, but with the excess fabric I had to take out I am wondering if the C cup might have been better and will toile this soon to check. I still have a little excess fabric between the bust and shoulders that is somewhat bothersome but I am sure a non-sewist would not notice! I used a navy sateen that wrinkles a fair bit, but is not as noticeable in real life as the pictures, or I am choosing to ignore it! 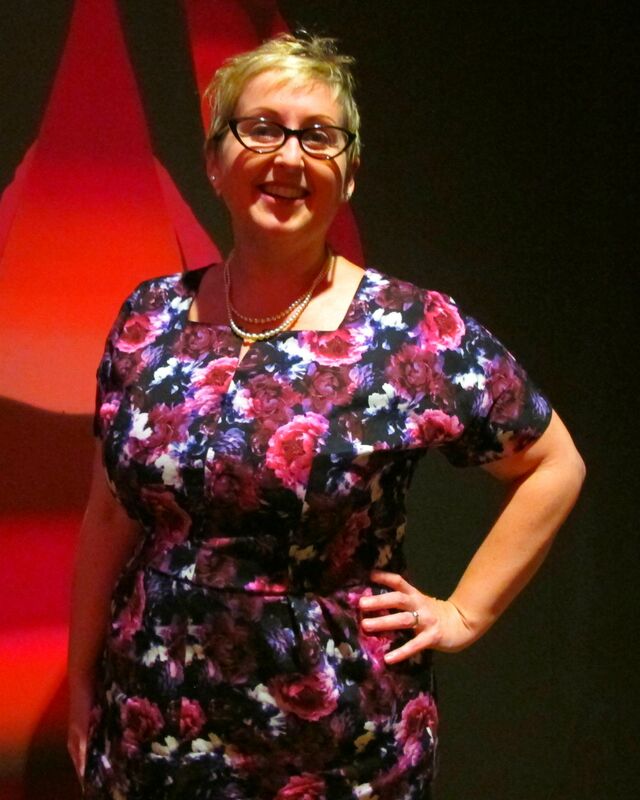 I like this dress a lot and find it is good to wear to work, not super corporate but dressy enough for the office. 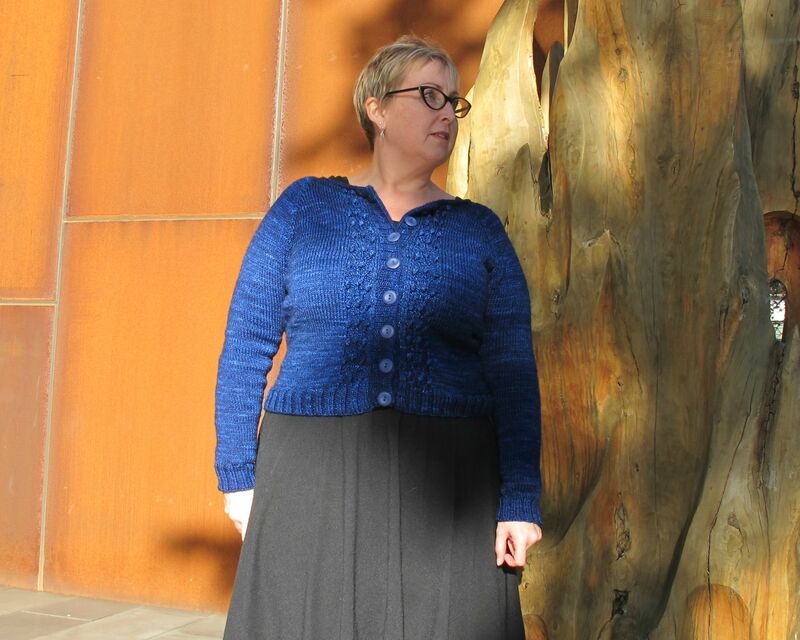 It is also easy to chuck on a bright coloured cardi and shoes to make it more cheerful. It is already on high rotation. All in all I think this pattern has big potential to become my next TNT. So now back to my train trip, only 2 hours to go and I’ll be back in Vienna in time for my flight back to Australia tonight. 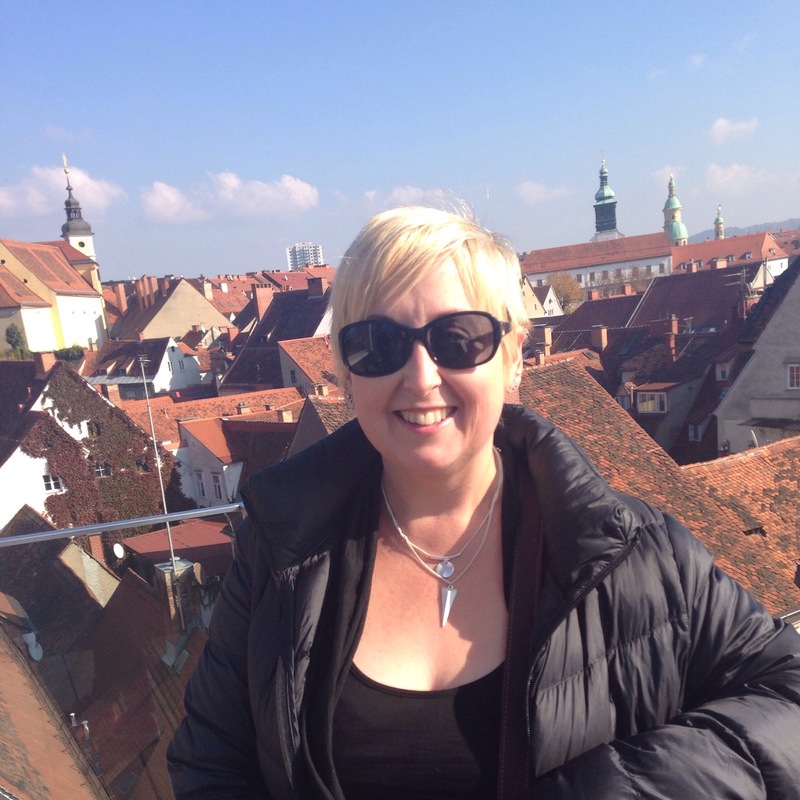 I’ll bore you with some photos on my next post but for now, here I am at a rooftop cafe on a gorgeous sunny day in Graz during a break from the competition. I am sorry, I could not think of a better title other than the obvious for this post, but as I am not feeling the jacket, I just couldn’t feel the title either. In the interests of sharing the bad as well as the good, I bring you my Grainline Morris Jacket. Check out my forced looking smile as I pretend to love this! 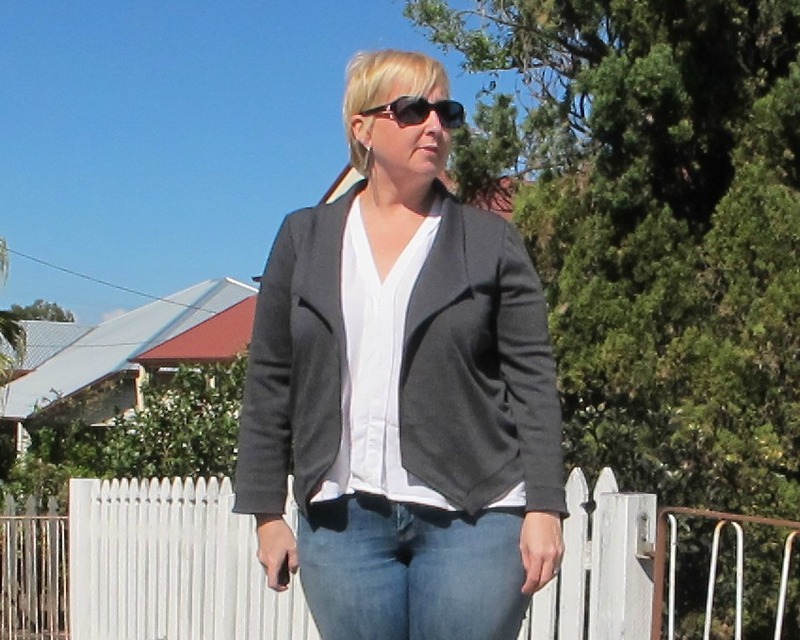 I have a GAP French terry double breasted blazer in my wardrobe and I absolutely love it. It is great for travelling, dressy but comfortable and never needs pressing! I need to replicate this feeling and thought the Morris jacket might come close. SPOILER ALERT – sadly not! I made this in a stretchy grey ponte from my stash. I quantify this as stretchy as some ponte doesn’t stretch much at all, this one does and is a lovely quality (bought during a trip to LA from The Loft and paid for by weight!). As with most makes I have seen on the interwebs I ended up with the ubiquitous puckering at the hem. Going in prepared, I was so sure I would be able to avoid it. First I used a stretch lining on the facing as I felt that the issue was caused by the front panels not stretching the same as the facing. But I still had puckering. So I ripped out the facing and the puckering remains. So ugly. I then hand blind stitched the facing down as I think it is a weighting issue of the facing vs the front. But now my issue is my stitching is not so blind and can be seen from the outside! I have seen some versions where the facing has been topstitched down on the machine and this looks ok in a print, but wasn’t the look I was going for. (maybe a double line of stitching would work) I hate that the visibility of the stitching makes it look home-made! 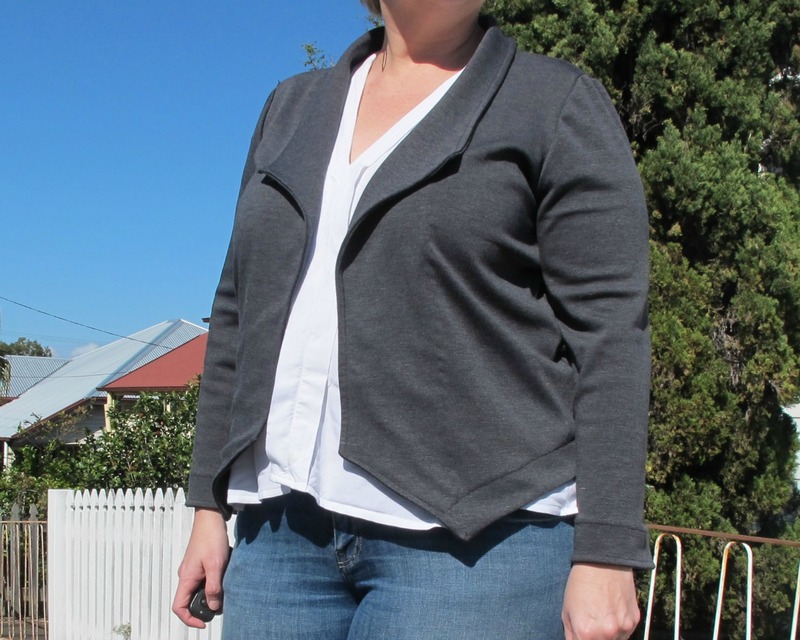 The jacket super comfortable but in my opinion should be made in a stretch woven like a sateen, not a knit like ponte. But that being said, I have seen in a sateen and it was quite stiff and boxy. This is just not for me, too boxy, too puckering and just not what I had envisioned. I haven’t thrown it in the bin just yet, I’m still thinking there must be some way to save it, if nothing else, the sleeves could be used on another jacket as I have some fabric left. So now my search continues for the perfect knit blazer. Onto a Burdastyle pattern next! 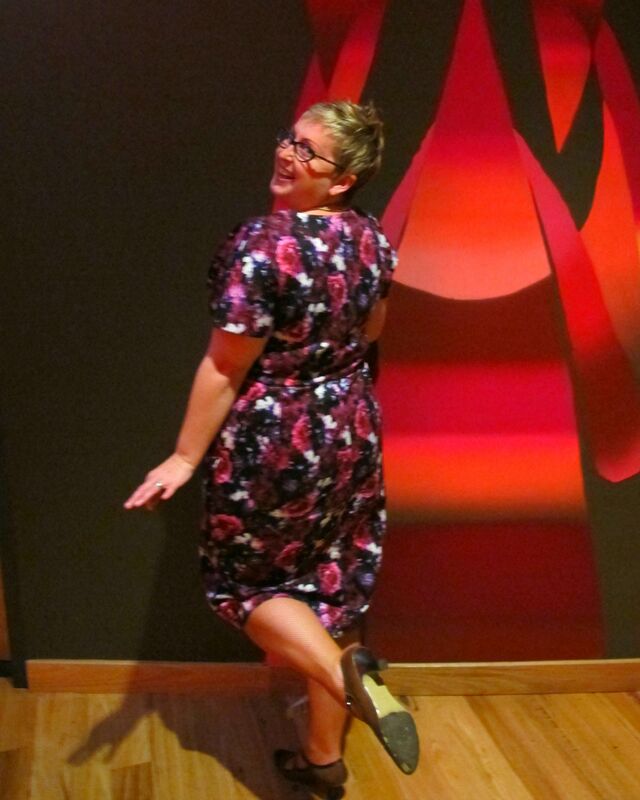 This dress was made at the recent (hmm ok not so recent, it was June) Sewaway weekend in Melbourne. 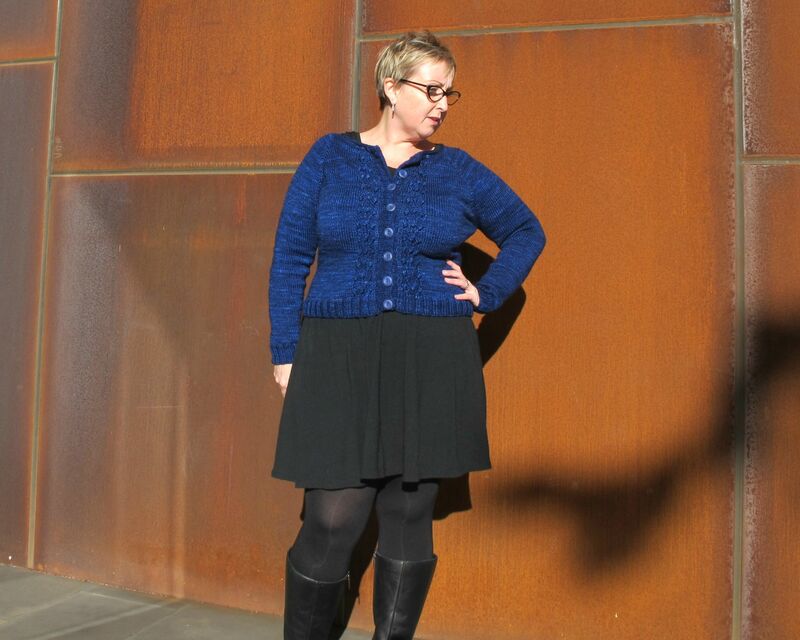 In my defence of the lateness of my post, it has been pretty cold (for me) lately and I really did want to photo this without the cardi & tights that is normally a staple at this time of year. Plus it’s too dark when I get home to take pics and the first thing I’m thinking about when I get home is dinner!! The pattern is the Deer & Doe Reglisse. 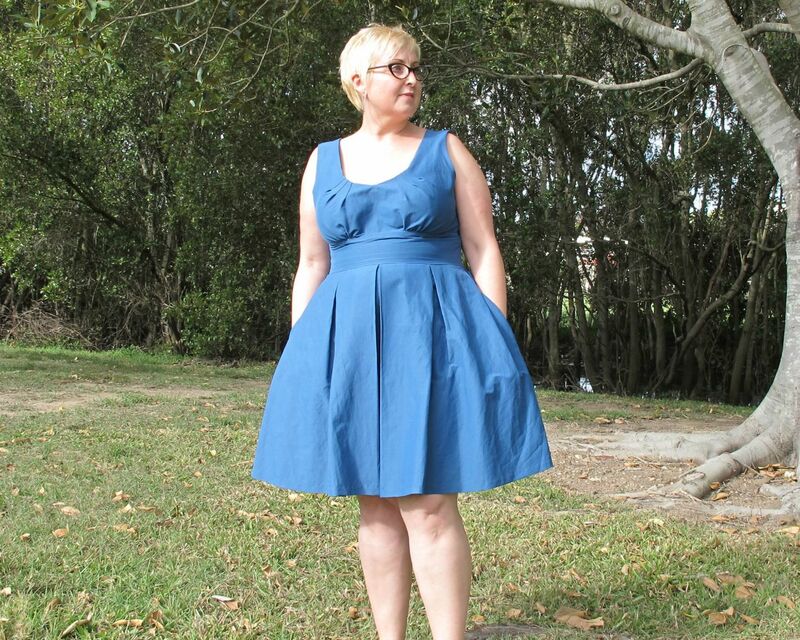 The dress has a bias cut bodice with cap sleeves and a three quarter circle skirt. 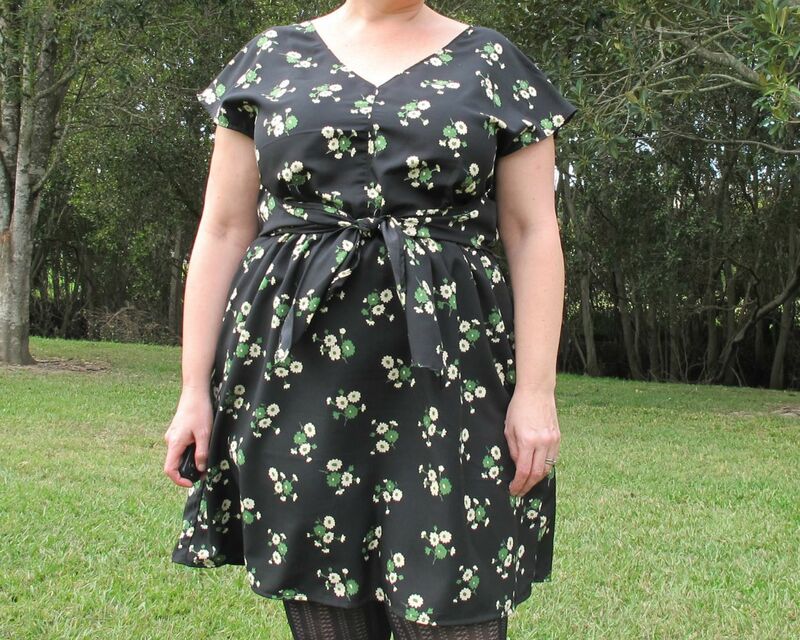 The dress went together very easily and I am really happy with the fit straight out of the envelope. 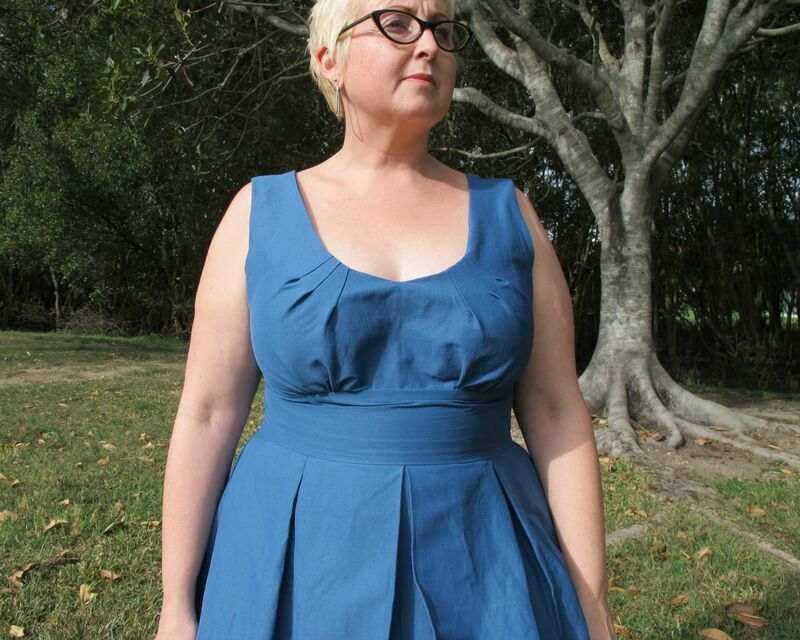 I figured with the bodice being on the bias might mean I could avoid an FBA – I think I can get away with this as there is no obvious pulling. I used a supposed rayon from my stash bought a couple of years ago in London, I am pretty sure this is a cotton though, it just doesn’t have the drape that it should. What to say about this pattern? Well I like it, but I don’t love it. I feel like it is perhaps a bit boxy and like the cap sleeves make me look a little broader. I’m not fishing for compliments, believe me, just being honest. 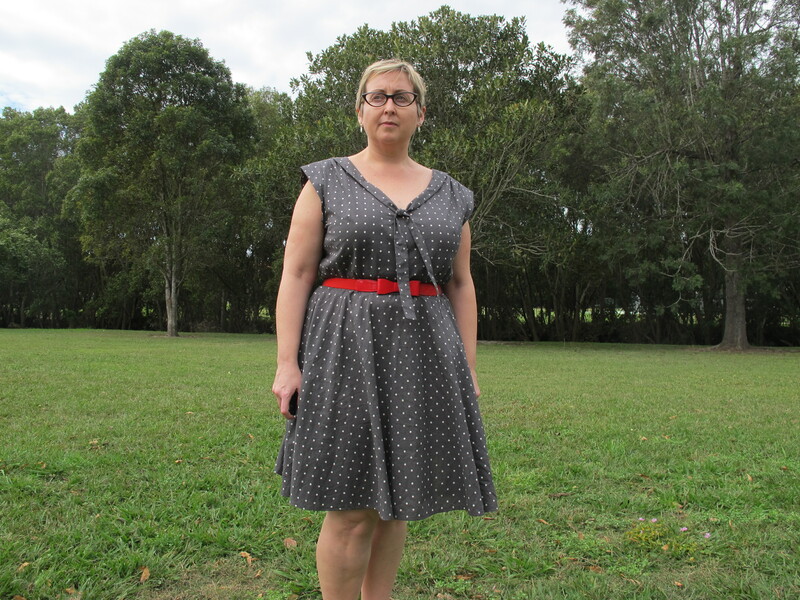 I still wear it and of course love the polka dots, but I just don’t love the shape on me. I’m also not the biggest fan of the elasticated waist. 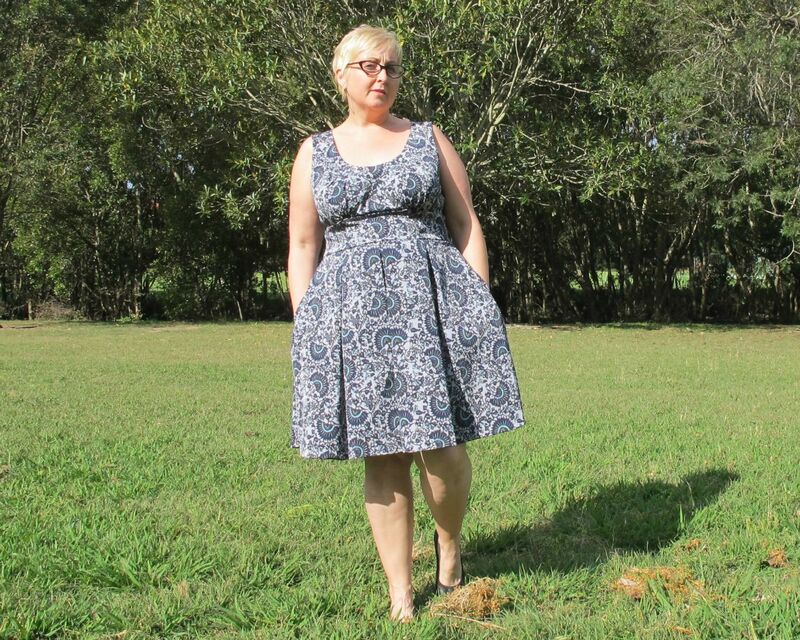 Normally I love an elastic waist for comfort, but the pattern calls for 1 1/16″ elastic so this is fairly wide and sits kind of loose. I would suggest altering this otherwise a belt feels necessary all the time. The waist casing sits funny, but a belt sure fixes this! it would be better with pockets, cos all garments should have pockets! Apparently I’m falling over in this one! So there you go, my mediocre Reglisse dress. Have you made anything a little meh lately? You know, nothing glaringly awful, that you’re just not feeling? Hello again! Finally I have chance to get back to the blog. 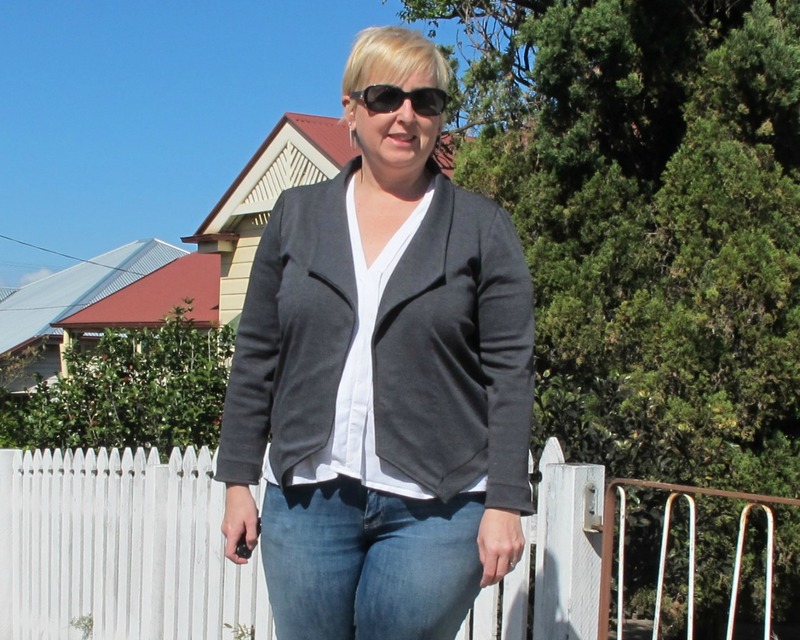 It has been crazy busy around here lately, mostly because I went to Melbourne Frocktails last weekend and procrastinated on my dress and then decided last minute that I needed a coat too! Yep – I am clearly quite mad!! However, job done and I will share these with you soon, just need to take some pics! 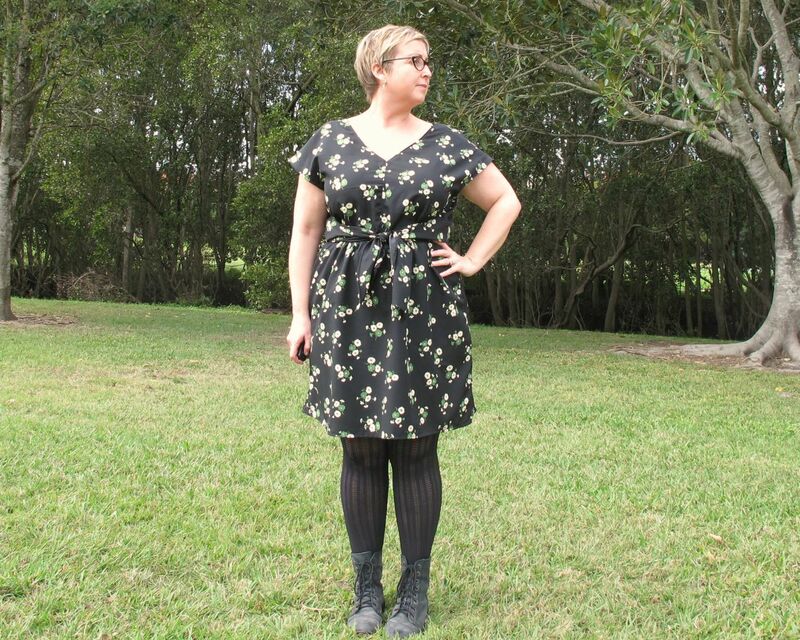 I have a shite-load of garments that I am behind on blogging, but this is my new favourite to wear so you get to see it first! 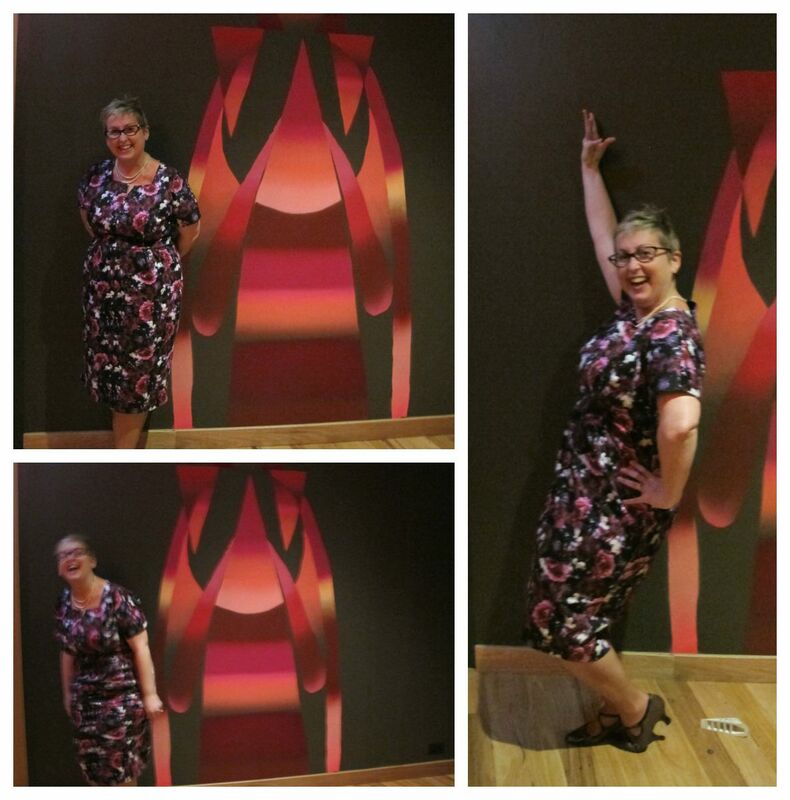 I made this when procrastinating on making my Frocktails dress. 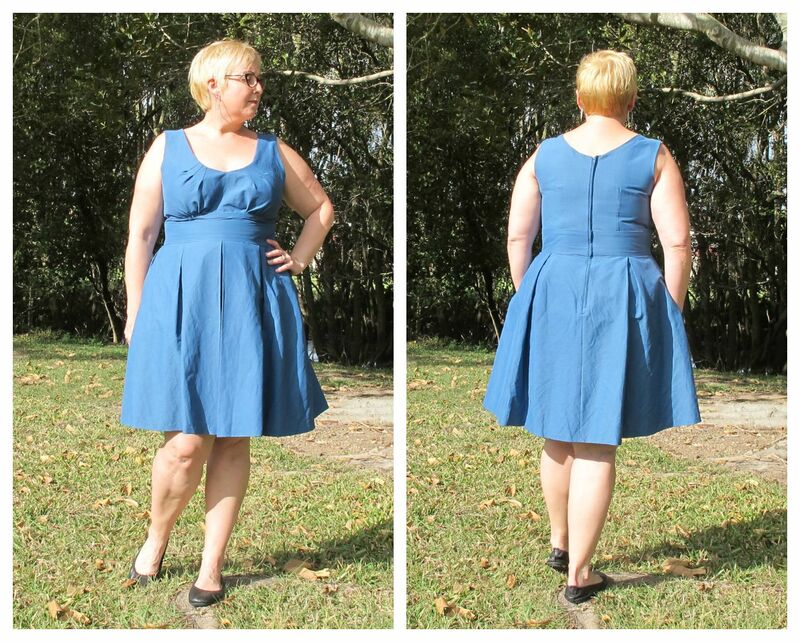 It’s V1395, a sweet little pullover, elastic waist dress with waist ties (get my blog title now? insert eye roll here). 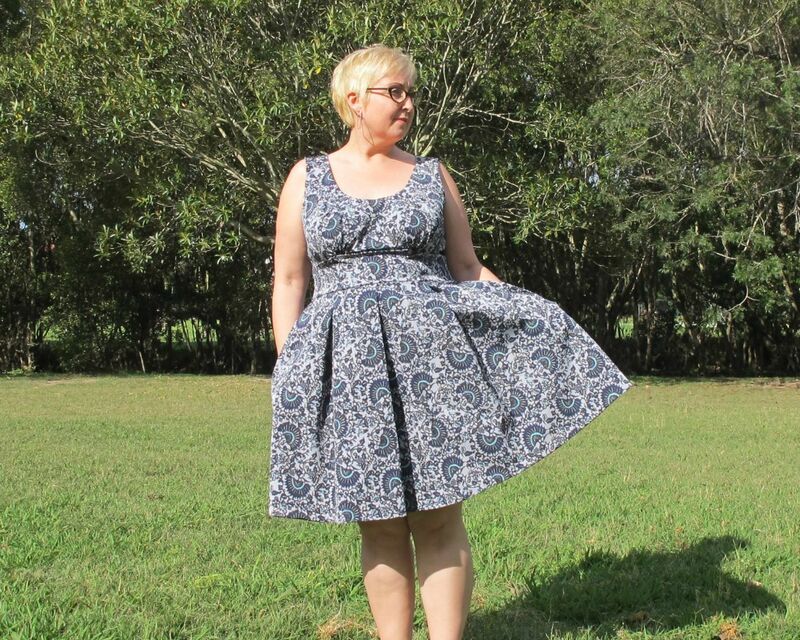 I expected this to be a comfortable dress and wasn’t sure it would be overly flattering, however I was hopeful and forged ahead in a polyester from my stash in the home of ending up with a wearable muslin. Better than that, I have a dress that I love and now am planning more!! I’ve no idea why I am frowning so much in this pic!! I cut a size 16, narrowing at the shoulders as is normal for me. I also raised the shoulders as I am short in this area. As it was intended to be a wearable muslin I skipped the French seams and just stitched and overlocked as is normal for me for most garments any way. I don’t like how the instructions have you attach the lining and create the casing. It is not stitched down in anyway and therefore doesn’t sit flat at the waist. I think next time I will stitch the casing to the dress at the time of creating it. 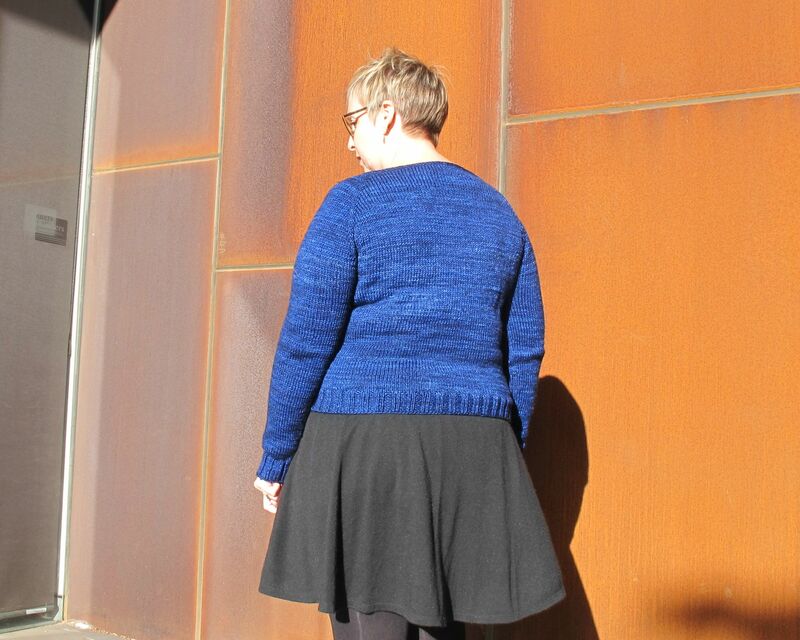 I didn’t end up with the low armholes that other bloggers have mentioned, I think because I raised the shoulders. I only shortened the waist a smidgeon at the back so be warned if you are taller. 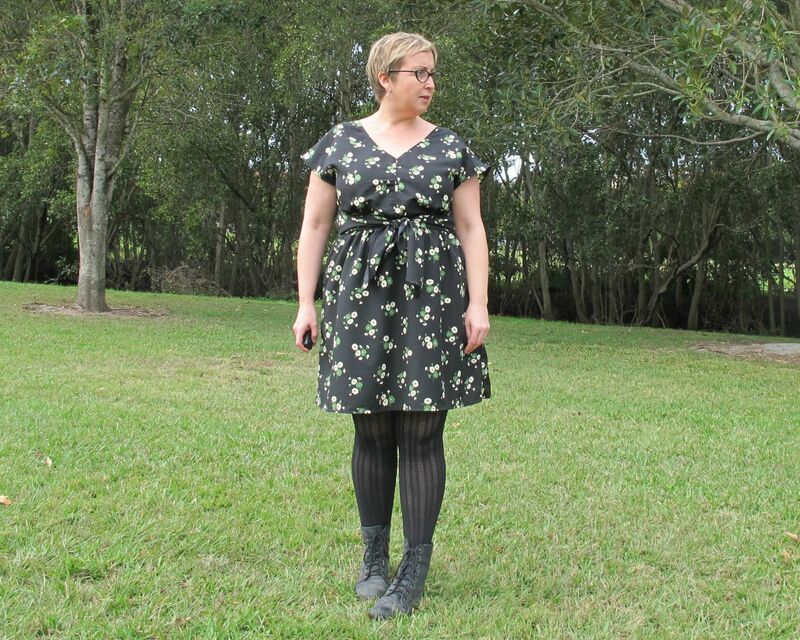 Also, this is the pattern length, again pretty short since I am only 5’2″. I love the ties, but be aware if you make this that the reverse of your fabric will be visible. I swear I must be the world’s slowest knitter, but I do finish things….eventually. Not like my Mum who used to have a stack of half made jumpers, my favourite being a neon orange jumper she started in the late 60s – no wonder she never finished, she was probably going blind trying to knit it! 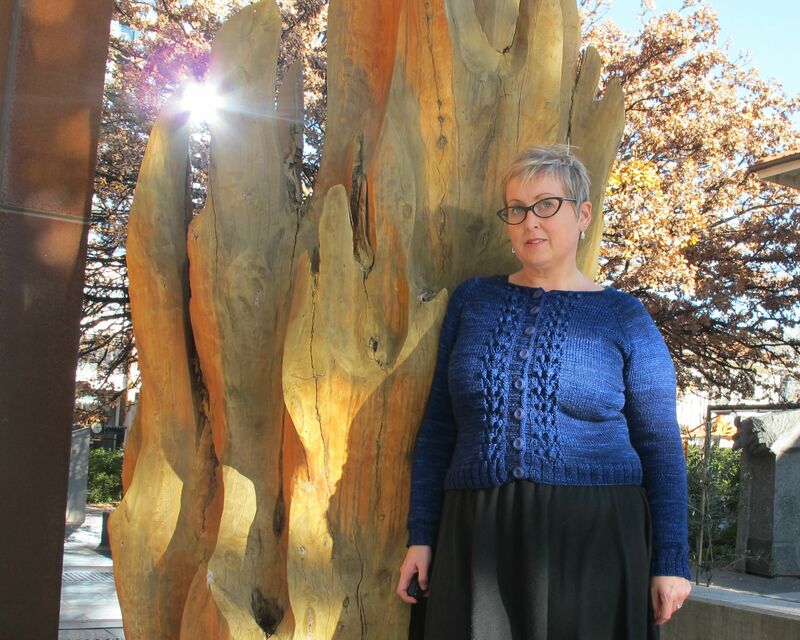 This is the Rock Rose Cardigan, knitted top down, mostly stocking stitch but with a cool bobbly pattern down the front to keep it from being too boring to knit. The pattern repeat eventually got its way into my brain and so I was able to knit without having to refer to the pattern all the time. I like the raglan sleeve for fit across the shoulders. But my favourite bit is the I-cord bind off. I had never done this before. It goes all the way up the button band, across the neck and then back down the other button band. This technique takes forever but the finished result is super professional. I used a Madelinetosh yarn in the colour Fathom. I really like the variegation of the colour with this brand and it is lovely to work with, even though it is pretty ex-y. I bought it on a trip to the US in 2013 – buying things on holiday never seem expensive, it’s all just part of the experience 🙂 (well that’s what I tell myself anyway!) If I could fault this at all, it would be that it is a little big. You can see in the above photo the roominess under the arms. This is a little annoying as I did get gauge so I thought it should have been fine. Anyway, it’s not so big that I won’t wear it. My favourite part is the vibrancy of the colour – it just glows – so lush. I’ve moved on my next project, the Boxy & Buttony Jumper so expect to see that sometime in the next 12 months!! I bought this fabulous cotton sateen fabric at a recent Spotlight sale. I asked my dear darling husband “do these colours suit me?”. “No” he says. So of course I ignored him and bought it anyway (what was he doing in Spotlight anyway??). I just couldn’t resist the vibrant colours with the vintage feel. It just had to be made up into a vintage dress, the only question was which one?! 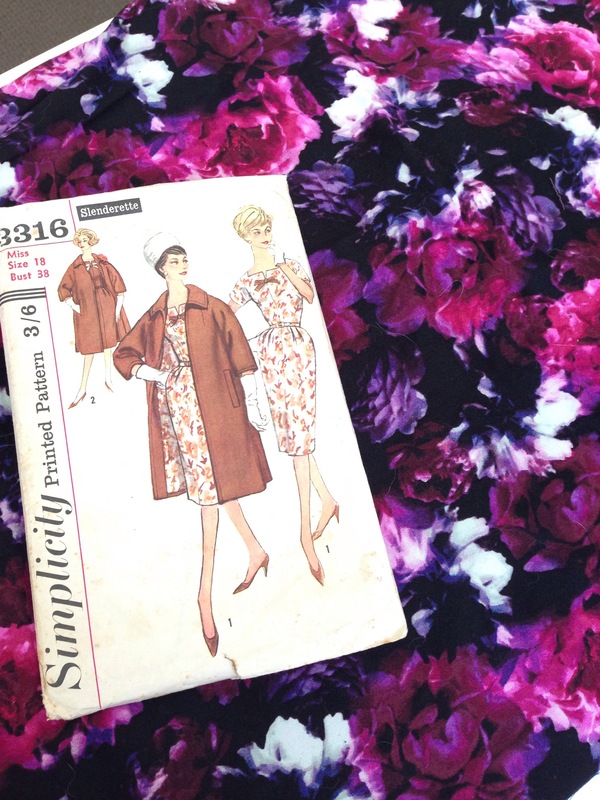 I settled on Vintage Simplicity 3316 which Wikia says is from late 1950s/early 1960s. I was particularly drawn to the kimono sleeves and the coat (which I have a plan for soon). I did a muslin of the bodice and it fitted really well and so with no adjustments I cut into my fabulous fabric. 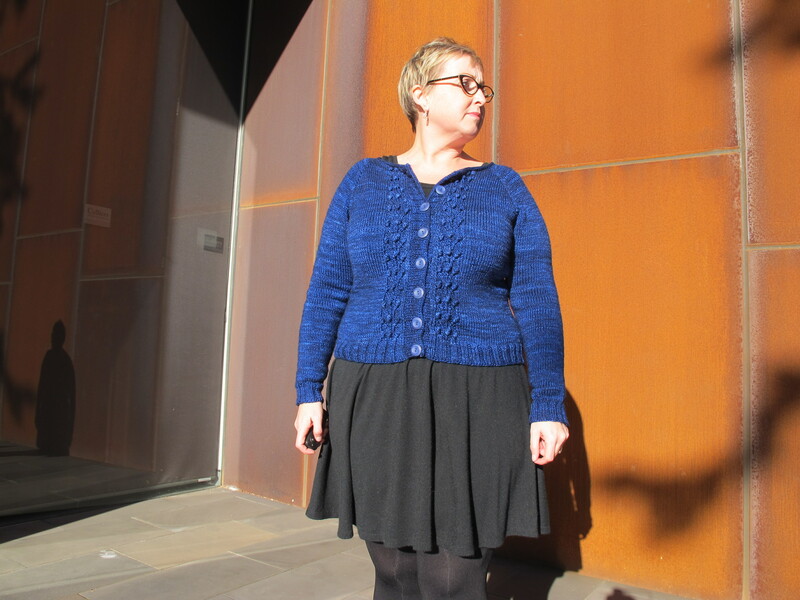 I sewed the majority up on the Sewaway weekend in Melbourne, but it was too cold to constantly try it on so I left the finishing for home. 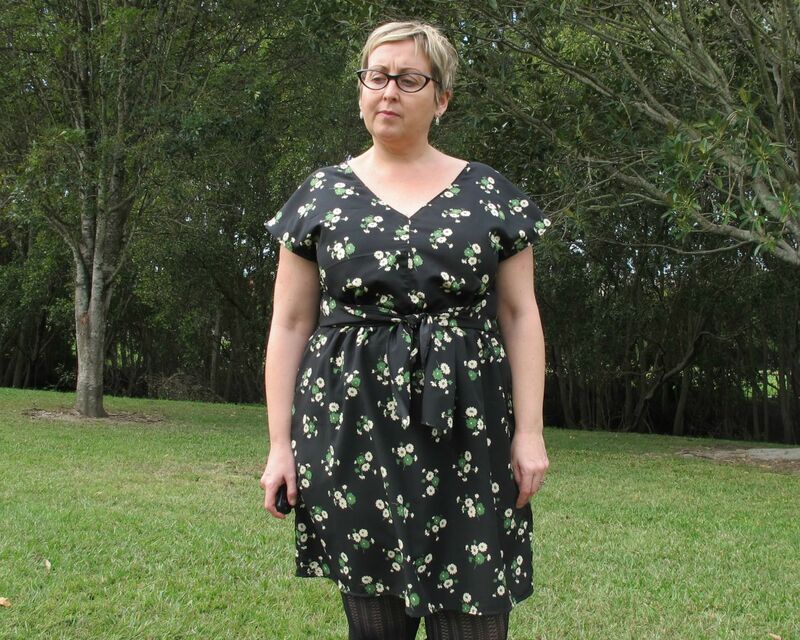 I ended up taking 1¼” off the shoulders as I had some fabric pooling under the arms, but apart from that, no adjustments. No FBA!! 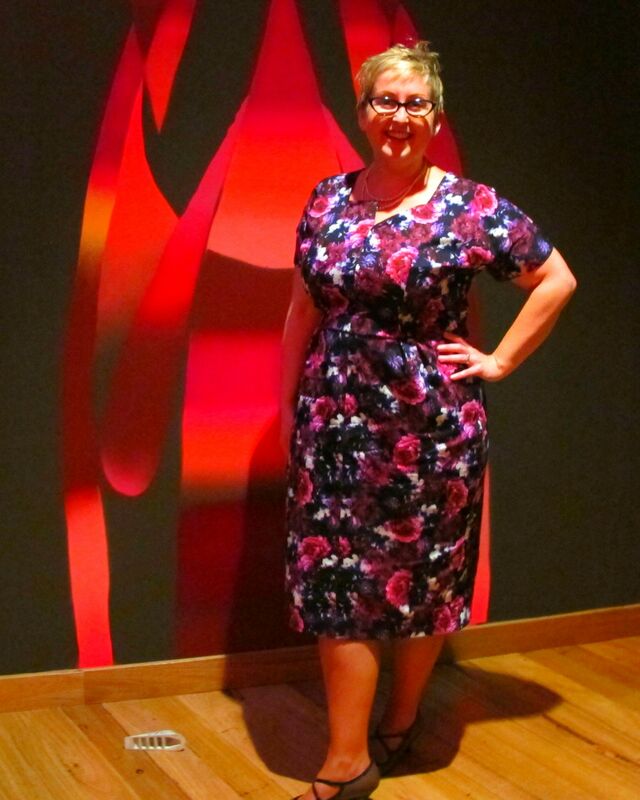 Of course this fabulous dress needed a fabulous event and Canberra Frocktails was it! Those girls sure know how to organize a fun shindig! Blimey there was a lot of champagne, so much for the two glasses included, more like 5 or 6. I must have had a dodgy canapé though as I was talking to the porcelain telephone later that night 😉 Oops! Can you guess who took my photos? The fact I can’t stop laughing might give it away. 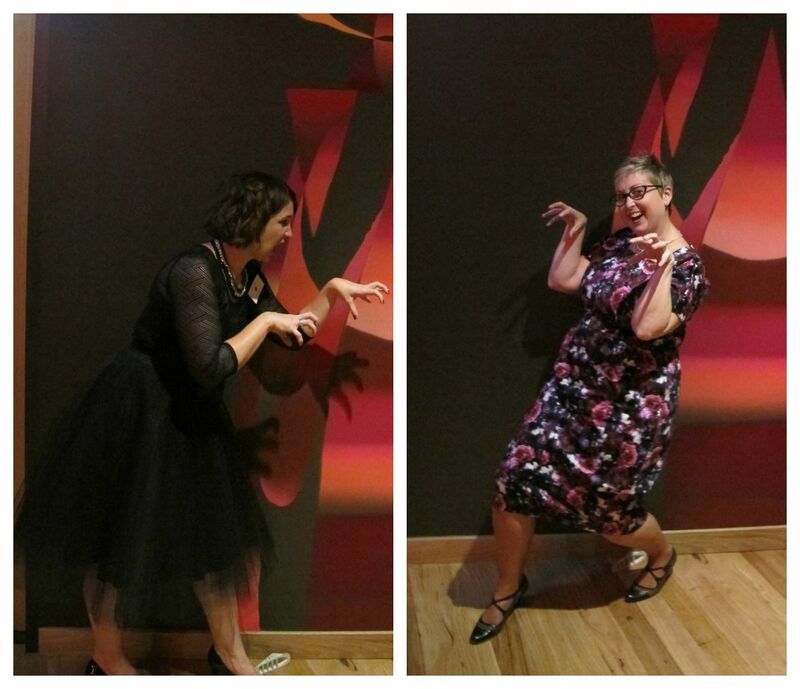 Pictures taken by the wonderful lady that is Amanda – this girl is so warm and genuine and of course an all round sewing wizard with rad raptor poses! And blimey she can rock a tulle skirt!! 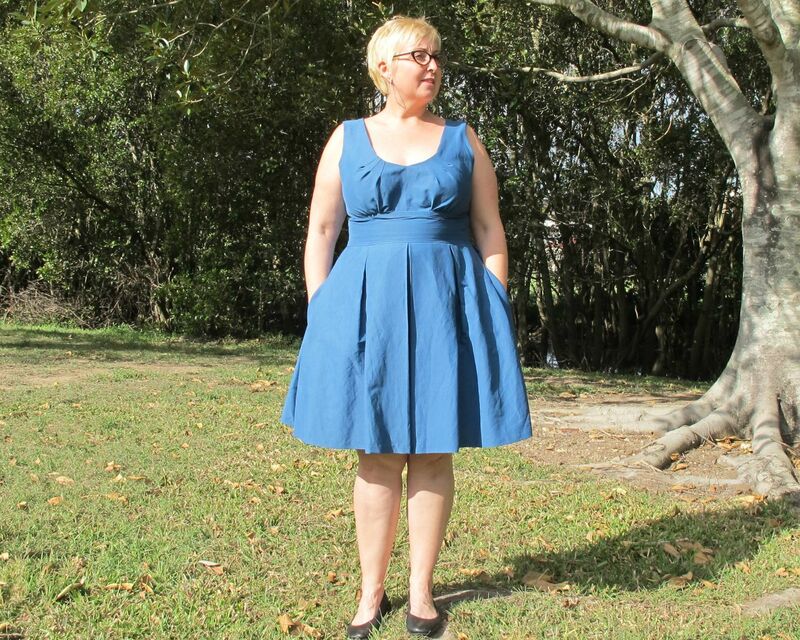 PS – that’s the second of my Vintage Pledge dresses complete – one to go! !